Pune foodies, rejoice: Flags is back! They were apparently renovating and are now open again. They have redesigned the seating area with a longer bar. However, the menu continues to be exhaustive like before. A new cluster of restaurants and bars opened last week in the ICC complex. Sky Bar and Grill, FL Lounge, Sundowners, and Indus Kitchen are located on the top floor of the ICC complex on Senapati Bapat Road and promoted by Mumbai's Foodlink group. I had earlier reviewed the lounge area of Stone Water Grill. This time I was back, but to the dining area. On a Saturday evening, this place is jam-packed with Pune's beautiful people who want to see and be seen here. The restaurant is doing its bit to make the lounge exclusive by keeping cover charges sky-high during the weekend. However, the dining area is a lot easier to book. Flowing water, intricate patterns of mirror-work and open spaces give it an upscale ambiance. Large windows look out into the lounge area. The menu combines Mediterranean staples with wood-fired pizzas and a variety of pastas. We ordered a variety of starters (note: portions here are only good for one person and can be difficult to share). 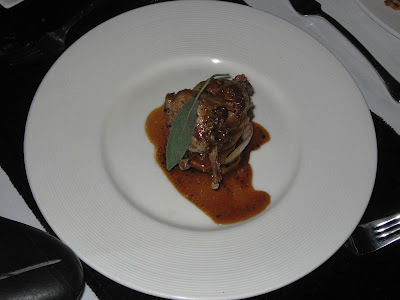 I liked the wood-fired quail: crisp on the outside and very flavorful. 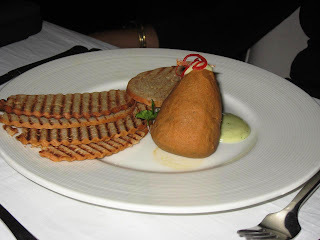 The Shammi style lamb pate was very interesting too. However, the Smoked Chicken and Goat-cheese tart was somewhat ordinary - regular chicken tikkas with a cheesy dip. 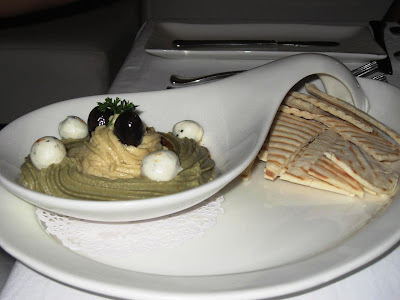 The Lebanese Mezze Platter was good with small portions of hummus, moutabbel, labneh combined with wood-fired bread crisps. 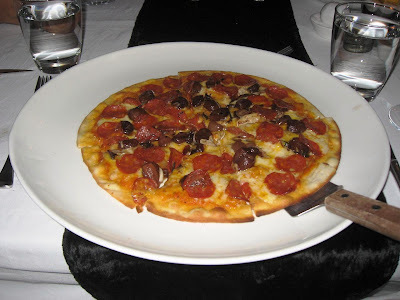 I then ordered a Salami Napoli pizza which also had caramelized shallots making for a very interesting taste. 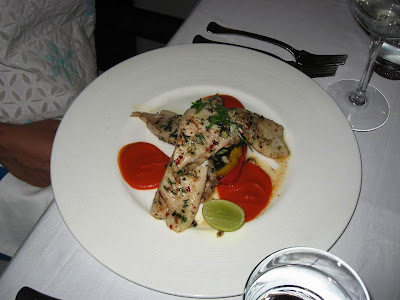 My wife ordered the Chilli Coriander Crusted Pomfret which was served in a creamed pimento coulis and tossed veggies and was excellent too. 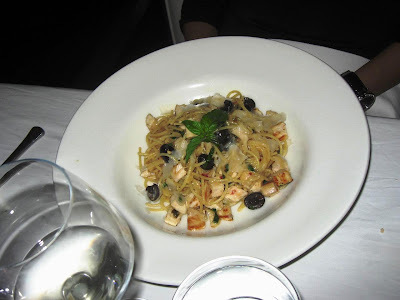 Our friends ordered the Aglio Olio Peperoncino and found the spaghetti reasonably good too. We washed these down with a bottle of Sula Chenin Blanc. Interestingly, Chenin Blanc grapes are versatile white grapes that can be used to make dry, sparkling and even sweet dessert wines. 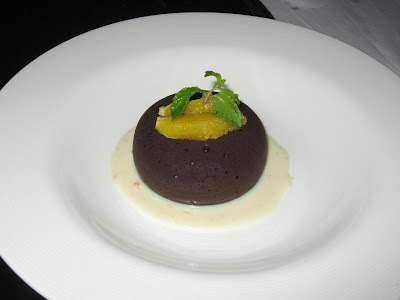 I insisted on trying the Warm Chocolate Fondant and it was an instant hit! 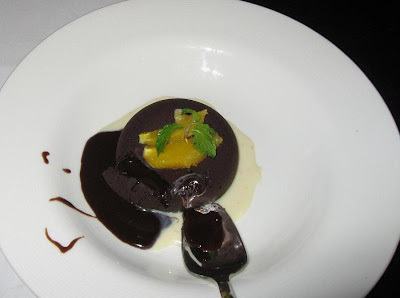 Oozing chocolate, the dessert was excellent and a good ending to the evening. As we walked out, the crowd in the lounge was continuing to swell, with only standing space left. Next door, Hard Rock Cafe was getting crowded too, and there was another party on in the adjacent property. It took us almost 30 mintues to get our car out of the parking; there were Santros and Marutis jostling for space with a large, black Bentley. Men with gelled hair and women in little black dresses had to walk the last mile, some precariously wobbling on the uneven driveway in their high heels. All in all, a great dining experience. However, if you hate crowds - even the fashionable ones - avoid the weekend evenings. @Sharmila: Crab? Well, Mainland China, Coconut Grove, and Mahesh Lunch Home are possible options. You can get crab in butter/pepper or butter/garlic here. I did blunder yesterday.I ordered v lotus wrpd rice, Cantonese rice ndl and just One V wok Tossed Dumpling Chilli & Soya. The combination became very dry. Thanks for the heads up about the FL lounge, we heard about it first on your blog. We went there this Friday evening and tried their Italian section. The food was fairly ok but they need some major catching up to do on their liquor bar, since most of the options listed on their menu were not available. I guess they are still in the process of getting a permit to serve alcohol. But this place really has its location going for it. The top of the ICC made for a very very pleasant evening. @Harekrishnaji: Mainland China has the best track record. I have never had a dinner where every dish wasn't up the to mark and brought to the table at just the right temperature. Of course, you need to see that you order the right stuff, since taste varies from person to person. I prefer the spicier dishes. @Ashish: Thanks for the early review. 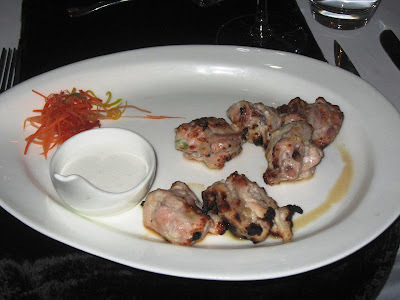 I did get a chance to visit Indus Kitchen too; 'will have a post on that soon. Flags holds a special place in Pune's Food Map.... It's the place where a puneite starts his introduction to world cuisine. @Manodeep: I guess you are right. It started the trend. Horrific experience at Flags in Pune recently. I have never been so physically ill from a dining experience. Both myself and my collegue ate chicken and had to miss two days from work recovering. I would not recommend this restuarant and I could not be paid to go back to Flags. @Anon: Ouch! That doesn't sound good at all. I visited Stone Water Grill just once. It was a horrible experience. We were a large group and arrived at the restaurants in batches. Inspite of having booked in advance all the different groups were harassed at the entrance. The security guards too were pretty wierd - they wore mouthpieces and were holding hands. The service too was average at best - maybe because the place was so crowded. The food though was excellent. All in all, I felt that the place tried to portray a very classy feel, but could not carry it off successfully. Mainland China remains an old fav. Flags disappointed me both the times I was there in Pune, but I guess I am in minority as folks go ga ga over it even here in Mumbai!So much so, I am trying to accommodate them in our mall too! @anon1, anon2: I am hoping you aren't the same person. So far, I have only had good experience at Flags. Re: Stone Water Grill, avoid the weekends, when this place is most appropriate for those who love to party and would rather settle in the (expensive) lounge. @Indraneel: Hmm...Flags has a reputation in Mumbai?! Mainland China is one of the most consistent restaurants I have ever seen. Consistently good, that is! Agreed on Mainland China. We were there on last friday and the food was excellent as usual. Had intended to visit Flags - now not so sure? You can keep the Stonewater Grill. It is overpriced (not including being charged for items / drinks not consumed!) and the "service" is appalling - even during the week. Sadly, the sons & daughters in their late teens of the wealthy and other poseurs will continue to provide them with revenue. @Ken: Flags continued to be good. As for Stone Water Grill, I guess they need to be more attentive to customers of their fine dining restaurant. Right now, I guess they seem to be more interesting in the coolness factor of their lounge.